Hey Coffeeholics! Its this time of the year again that we've all been waiting for -- the 5TH MEGABRANDS SALE! Do you know that Megabrands Sale is considered as one of the most anticipated events where shoppers buy their favorite brands at reduced prices, and as an effective venue for exposure and promotion for great and upcoming brands in the market. 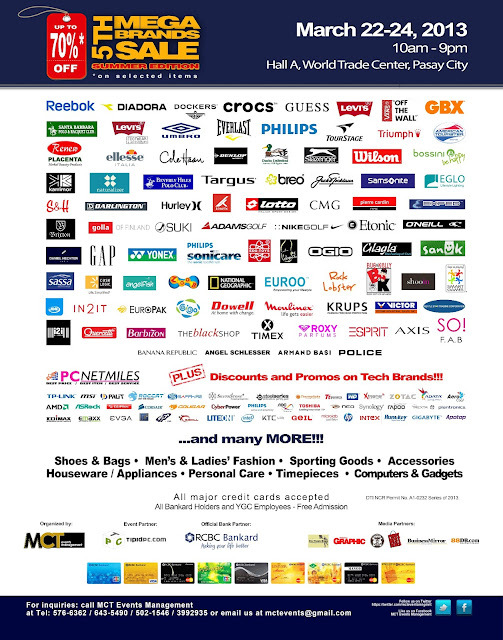 Once again, MCT Events Management will stage the hottest summer edition of Megabrands Sale on March 22-24, 2013, at Hall A of the World Trade Center, Pasay City with its official credit card partner, RCBC Bankard. A sizzling summer edition, the three-day Sale will showcase leading brands, both domestic and international. Price cuts are up to 70% discount from tag prices will truly make this SALE event worth going to. Discriminating customers await big discounts in shoes, bags & luggage, gadgets, men’s and ladies’ fashion, sporting goods and accessories, personal care, swim wear, time pieces, eye wear, house-ware, appliances, computers and gadgets. Participating brands include Samsonite, Cole Haan, Naturalizer, Levi’s, Dockers, Reebok, Rockport, Umbro, Diadora, Ogio, CMG, So Fab!, Nike Golf, Sanuk, Triumph, Hurley, Barbizon, Vans, Bossini, Ellese and many more. This summer edition will also feature the tech alley, gadget & gizmos and appliances area that offer great discount and promo’s brands include Dowel, Philips, Audio-Technica, JML, Toshiba, MSI, HP, Gigabyte and many more. There will be a soft selling on March 21, 2013 for the RCBC Bankard Credit Cardholders and for the event partners. The event will be officially open to the public on March 22 until 24, from 10am to 9pm. World Trade Center is accessible to both public and private vehicles. The event also falls on a weekend before summer officially start. Shoppers are also in for a treat. 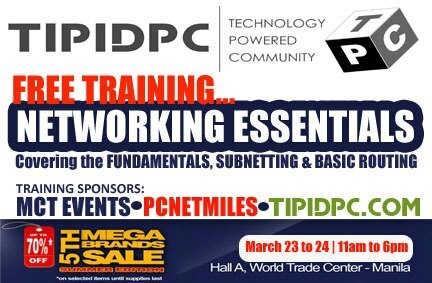 Aside from buying your favorite brands at a discounted price, there will be giveaways, raffle draws and free certificate course seminar courtesy of Tipidpc.com within the duration of the event. Special thanks to Tipidpc.com, RCBC Bankard our credit card partner. Our media partners: The Manila Times, Philippine Graphic, WhenInManila.com, PinoyBestDeals.com, Business Mirror, and 88db.com. So what are you waiting for Coffeeholics? Take advantage this weekend and check out the 5th Megabrands Sale at the World Trade Center! Happy shopping! mwah mwah!